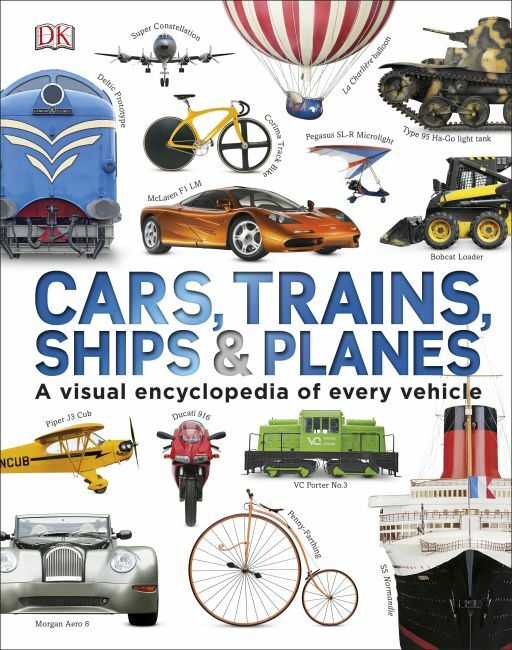 This visual encyclopedia for children is packed with all types of transport, including cars, motorbikes, trains, aeroplanes, ships, and even space rockets. Cars, Trains, Ships and Planes shows exciting vehicles that float, fly or speed across the land, including the record breakers - the fastest, largest, longest and most expensive modes of transportation ever to zoom, sail or soar. Explore over 1,000 different vehicles and discover fun facts and figures. This kids encyclopedia shows and tells the history of all modes of transportation, from the first wheel to racing cars, from hot air balloons to supersonic aircraft, and diggers, steam trains and war ships in between. If you are looking for vehicle books for children, Cars, Trains, Ships and Planes is the perfect gift for young transport enthusiasts, and their parents too.